Unsurprisingly, the most popular thing to do in Champagne Country is drink champagne. However, the region has plenty to offer visitors and the attractions are varied. Champagne Country is interesting from a military history perspective and has many military monuments, museums and battlefields. Despite heavy bombing of the cities during World War II, there is also still some quality medieval architecture to be found. 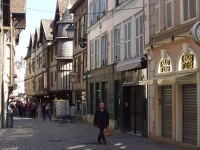 Tourists should head for Epernay and Reims to sample the best bubbly on offer in the region. Epernay hosts many of the great champagne houses and visitors can tour the cellars of both Moët et Chandon and Mercier. In Reims the Maison de Pommery, Mumm and Verve Clicquot, among others, wait to entertain guests. Both of these cities, though ancient, have suffered from wartime destruction and now seem industrial and modern. However, they do have some gems for the historical sightseer, like the magnificent Cathedrale Notre-Dame de Reims, where dynasties of French monarchs were crowned. The quaint and well-preserved old town of Troyes, which dates back to the Roman era, gives visitors an idea of how the grand cities of the region must once have looked. It is jam-packed with picturesque old buildings and interesting museums, as well as several incredible churches. Amiens is a good base from which to explore the battlefields, cemeteries and memorials of World War I. Possibly the best place from which to explore battle sites in the Champagne Country is the industrial town of Chateau-Thierry, where the surrounding countryside has borne witness to great battles during both World Wars. Here visitors can explore the WWI Aisne-Marne American Cemetery and the Belleau Wood battlefield, among other moving sites. We are looking for contributors for our Champagne Country travel guide. If you are a local, a regular traveller to Champagne Country or a travel professional with time to contribute and answer occasional forum questions, please contact us.